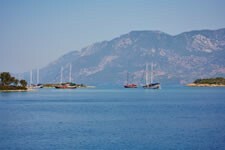 Our suppliers have contracted excellent rates with the local hoteliers making Turkey one of the cheapest destinations for all inclusive holidays. Occasionally, you can spend only a few pounds more to upgrade from a bed & Breakfast board basis to all inclusive. The types of all inclusive in Turkey can vary, with some hotels only including food and drink but other properties including drinks, food, snacks and entertainment, so make sure you read the hotel description to see what’s included in your all inclusive package. All of the big resorts including Alanya, Altinkum, Bodrum, Gumbet, Icmeler, Kusadasi, Marmaris and Side offer all inclusive holidays, but at UlookUbook.com, you can also find all inclusive holidays to smaller Turkish resorts.